You might have noticed I didn’t post on Wednesday as I usually do (if not, please forget I told you :P ), you want to know why? I forgot it was Wednesday. I should win the Most Disorganized and Forgetful Blogger Award. Seriously! Uggg. 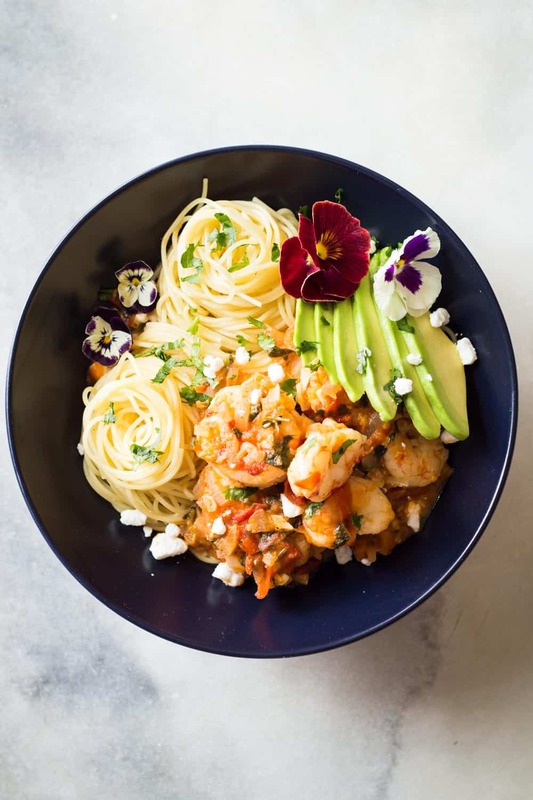 In my defence, this Mexican-Style Shrimp Capellini Pasta was photographed, edited and ready to be written about. I started cooking early Wednesday morning though and got completely consumed by a smoothie’s photography I was working on. When I noticed it was Wednesday it was already time to pick up the kids from summer camp. Ups! That shouldn’t happen again. I just set an alarm on my phone reminding me every Monday, Wednesday and Friday that it is the day it is. Haha. 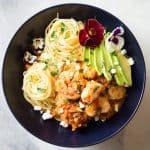 I will throw tons of Shrimp Capellini Pasta recipes and Smoothie recipes and the like at you consistently, like I’ve always done, hopefully without forgetting. You’ve got to understand, there is still a possibility I will forget despite the alarm. I’m a master at snoozing alarms until they stop going off. Why?!?! Capellini is an Italian type of pasta similar to Spaghetti (long strands) only much, much thinner than Spaghetti. What is the main difference between Capellini and Spaghetti you ask? Capellini cooks in less than half the time regular Spaghettis do (3-4 minutes) which is AWESOME!! 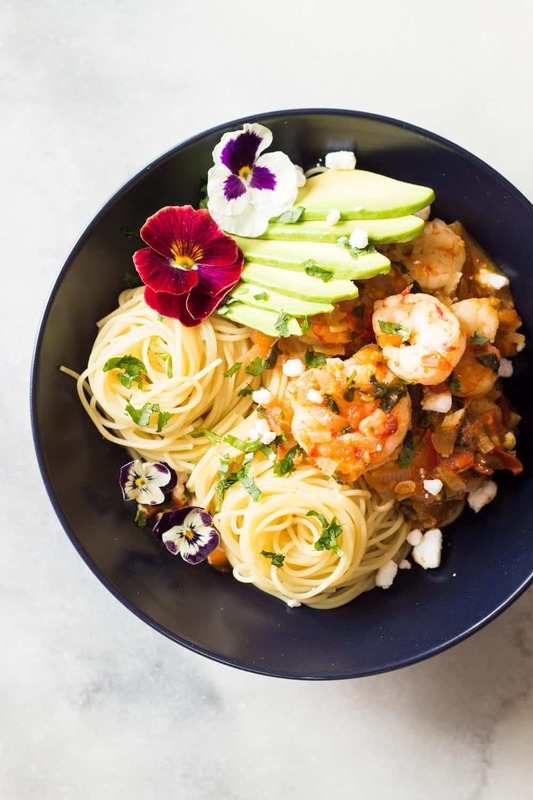 The most delicious way to prepare this angel-hair-like pasta, in my opinion, is obviously this Mexican-Style Shrimp Capellini Pasta, duh! Shrimps are one of my absolute favorite proteins. They taste amazing and cook in about 2 minutes. 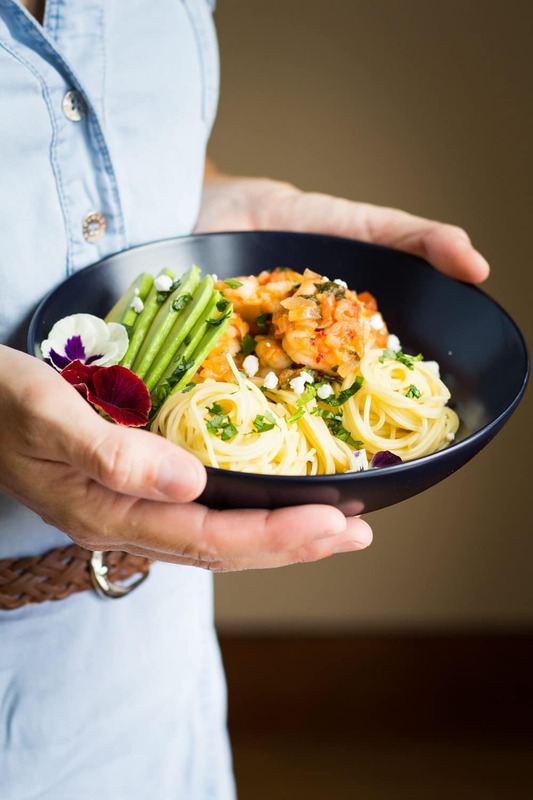 4-minute Pasta, 2-minute Shrimp, are you recognizing a pattern here? Deliciously sweet and aromatic tomatoes are the base of the delicious sauce. Perfectly ripe avocados add to the dish’s creaminess and some queso fresco can’t miss in a Mexican dish, can it? I hope you enjoy this recipe as much as we did. Tell me in the comments below and see you on MONDAY (only 3 more nights), alarm is set and recipe pictures taken. Little teaser: a delicious smoothie. YUM! Bring about 3 liters of water to the boil. Preheat a cast iron skillet over medium heat until very very hot. Peel and chop onion and peel and crush garlic. Wash and dry cilantro, destalk and chop. Add a splash of olive oil to hot skillet, then add shrimp, season with salt and pepper and cook until bright red (depending on the type and size of shrimp you are using this will take between 1 and 3 minutes per side). Remove cooked shrimp from pan. Add another splash of olive oil and sauté onion and garlic until onion is translucent. Add tomatoes and cilantro to skillet, pour in chicken stock, season with salt and pepper and reduce heat to medium-low. Let simmer uncovered for about 20 minutes. Peel avocado and cut into slices. minutes before tomato sauce is done add Capellini pasta to water and stir with a fork every minute or so to ensure they don't stick together. Once pasta is cooked, drain, quickly rinse with cold water (this is to prevent pasta from sticking together) and then serve in bowls. Add shrimp to bubbling tomato sauce for about 30 seconds to reheat, then serve over pasta. Add sliced avocado on the side and sprinkle queso fresco and some fresh cilantro over everything. What a delightful recipe… I love everything shrimp! Your photography is amazing also :) hugs! Thank you so much Silvia. How kind of you to write that :D I love everything shrimp, too!